Dorval has done it again! Introducing our newest Chocolate innovation, DORVAL PREMIUM COLLECTION® Crispy Chocolate Thins. These rich and delicious Crispy Chocolate Thins are the newest addition to our Dorval Premium Collection® line. Dorval Premium Collection ® Crispy Chocolate Thins are delicate, thin chocolates with a crispy texture, sure to please the taste buds. The 2.64 oz. Crispy Chocolate Thins are available in: Milk Chocolate and Dark Chocolate, and the newest flavor profiles to the Collection- Milk Chocolate with Orange and Milk Chocolate with Hazelnut. As with the Dorval Premium Collection® Chocolate Sticks, the new Crispy Chocolate Thins are made with only the highest quality all natural ingredients. The packaging has stunning, brightly colored graphics that showcase the unique item that is the new Crispy Chocolate Thins. The dynamic new specialty chocolate item is available to ship right now. 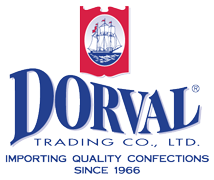 For 45 years, Dorval Trading Co., Ltd. has been an importer of an extensive range of high quality confectionery products from major manufacturers around the world. Dorval has grown into a significant presence in the confectionery and specialty distribution arena. For more information, contact Dorval Trading Co., Ltd. at (800) 367-8252 or at info@dorvaltrading.com, or visit our website at www.dorvaltrading.com. DORVAL TRADING CO., LTD. proudly introduces their NEW and IMPROVED TOP POPS® CHEWY TAFFY CANDY POPS! DORVAL TRADING CO., LTD. announces its latest SOUR POWER® item – 1.75oz BELT PACKAGES! Dorval Trading Co., Ltd. announces its latest SOUR POWER® flavor in the Bulk Belts category – MANGO! Dorval Trading Co., Ltd. announces its latest SOUR POWER® flavor in the 150ct Belts in Tubs category – WILD CHERRY!